Here is a photo of a very simple dinner we recently enjoyed: poule au pot. Not only is this one of the archetypical dishes of the southwest (remember the story of King Henry who promised “a chicken in every pot”? This dish is often called poule au pot Henri IV in honor of that famous pledge. Before he was Henri IV of France , he was Henri king of the then independent realms of Navarre and Béarn). In its simplest incarnation, poule au pot is a chicken poached with seasonal vegetables and served moistened with its cooking broth, sometimes enriches with a spoonful of duckfat. Its sort of the chicken version of a pot au feu. More elaborate versions involve stuffing a boiling chicken with a bread farce that may be combined with chestnuts, herbs, garlic, the heart, gizzard and liver of the chicken and bound with eggs. At the high end, truffles are slipped under the chicken’s skin and the stuffing is made richer with the addition of foie gras. In this case, the dish is often served in two courses, the first a soup of the clear broth, the second, the meat of the chicken, its cooking vegetables and rich slices of the stuffing served with a velouté sauce of the broth thickened with egg yolk and a spoonful of creme fraiche. This is how poule au pot is (was? Its been years since I’ve been) at the family run auberge “Le Coq de la Maison Blanche” in St.-Ouen outside of Paris, where I worked after completing my training in Paris. Depending on the season, the soup might include a delicate chiffonade of sorrel or tiny fava beans or, in winter, a brunoise of celery root and black truffle. Back in Orthez and returning to the real world, dinner is nothing like so fancy. 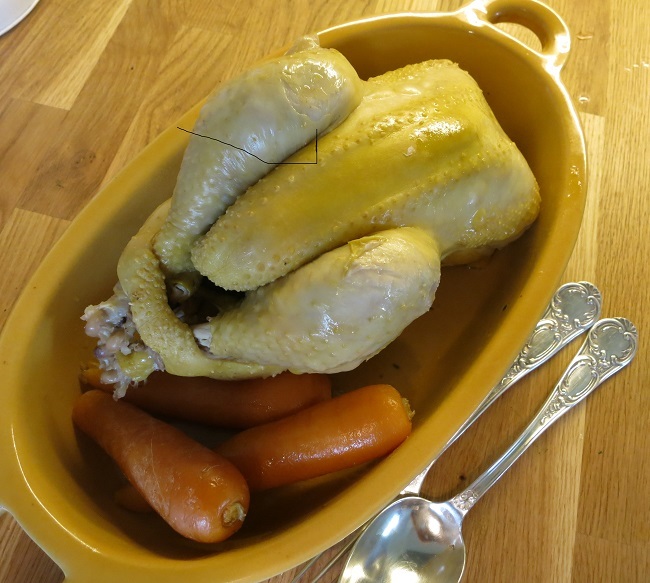 Just a farm chicken, its fat golden yellow from its diet of corn and garden bugs, poached with carrots. A earthy dinner that also has the side benefit of creating a lot of rich yellow chicken broth to use later. 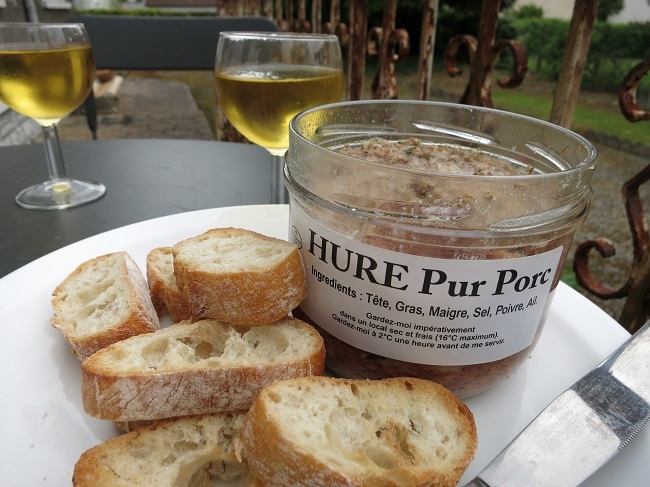 With aperitifs before dinner, we enjoyed this jar of hure pure porc from Ferme Abotia located near St.-Jean Pied de Port in the French Basque countries. It was tasty. Ferme Abotia is a producer of wines from Irouleguy who also happens to make some very good basque-style charcuterie. Thanks to Jason and Adrienne of Barrique Imports, who import the wines of Abotia into Seattle and who also left this jar at the house when they stayed last January. Hure is a terrine of pork head, similar to fromage de tete…see this earlier post for a discussion of the different uses that the French put a pig’s head to. This entry was posted in Stuff and tagged Béarn, Charcuterie, chicken, France, Pays Basque, poultry, Wine. Bookmark the permalink.